The beach is why most families choose North Myrtle Beach, SC as the seaside destination to spend their vacation. So it is important to have terrific views of the beachfront from your accommodations, as you do when you reserve a North Myrtle Beach vacation rental at Carolina Reef. All of the balconies at Carolina Reef are furnished so you can spend time out there doing just about anything: reading, eating a snack, napping, relaxing, bird watching and taking pictures. 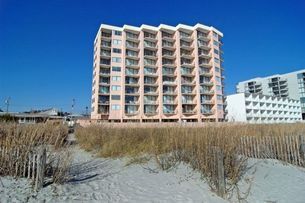 There is a small kitchen in each of these North Myrtle Beach vacation rentals. Having a refrigerator, cookware and, in some of these North Myrtle Beach rentals, a dishwasher on hand for the duration of your North Myrtle Beach vacation can make things even more fantastic. Carolina Reef offers families and couples a modern vacation in a beachfront setting! You will be so comfortable inside your North Myrtle Beach condo rental and lounging by the pool is a good way to renew your body and mind, too. But take one step onto the stunning beachfront and you might get a little sand in your soul. The beaches are a kaleidoscope of bright color, especially at sunrise and sunset when the azure sky turns peach, pink and purple. Look for a pod of dolphins cruising by Carolina Reef and watch the recreational boats and commercial fishermen offshore as they bob on the Atlantic Ocean. Where there are waves there are usually surfers so you can have a grand time just watching locals and visitors alike catch the waves and ride them to shore. When you spend your North Myrtle Beach vacation at Carolina Reef you will most definitely want to embrace your beach bum side. North Myrtle Beach amusements and attractions and entertainment are scattered throughout the area. Let fun be your guide as to what you will see and do during your North Myrtle Beach vacation at this oceanfront resort. Play a rousing game of championship golf or take a deep-sea fishing charter to the Gulf Stream for some wild sport fishing. Go on a kayak tour of the nearby inlet and salt marsh and rediscover your inner child with a playful game of miniature golf on one of the numerous putt-putt golf courses in the Myrtle Beach area. Indulge in spa treatments that pamper every inch of your body and rejuvenate for the rest of your North Myrtle Beach vacation with a facial, massage or mud bath. Engaging in all the fun that abounds near Myrtle Beach, SC helps to create an unforgettable getaway for the whole family. Be sure to include a show at one of the living entertainment theatres in the area during your North Myrtle Beach, SC vacation, in addition to some delectable dining on seafood at a popular Myrtle Beach area restaurant. There is renowned golf, fabulous shopping, thrilling water sports and more in North Myrtle Beach and in close proximity to Carolina Reef. Get hooked on pier fishing. Relax in the palm tree-studded surroundings. Uncork fun in the sun with some wine on your oceanfront balcony at this North Myrtle Beach resort. Life is beautiful when you spend your North Myrtle Beach vacation at Carolina Reef in the Crescent Beach section of North Myrtle Beach, South Carolina. Make reservations today and pack your bags tomorrow.